In this section we will take a closer look on technical analysis for binary options, and discuss in detail the indicators that are often used in trading. We have chosen the best binary options indicators, which are more efficient than the numerous exotic ones. These are the most widespread and the most effective binary option indicators. Each one is accompanied with a description, so that you can understand the mechanisms of each indicator and learn to effectively apply them in your trading. This indicator was developed by John Bollinger to check volatility (the price’s amplitude of oscillation). It is plotted as the upper and the lower limit of the sliding average, but the width of the band is not static – it is proportional to the mean-square deviation from the moving average on a given period. Therefore Bollinger lines can either shrink or widen depending on the market volatility. Breaking the indicator’s upper or lower limits is considered as a trading signal. One of the Bollinger Bands’ characteristic features is the fact that the price has a tendency to come back to the moving average in the middle of the indicator, and this often takes place after a bounce from one of the indicator’s limits. This indicator shows a function’s average on a certain period previous to each given point. The plotting period (the number of time series taken for the average) is chosen by a trader depending on the tool used and the particular market situation. It is important to know that the bigger period you take, the smoother average you will get, and the slower it will react to the price changes. And vice versa: the less smooth a moving average is, the quicker it reflects the price changes. Simple Moving Average is the least complicated for calculations. In order to calculate it, the closing prices of «N» previous periods are summed up and divided by the same «N» number. It’s as simple as that. The obliquity of the moving average on the chart will show us the trend direction on the market. There is only one problem with the simple moving average method — it is sensitive to market spikes (a candle with a long shadow). You can take it as a signal and decide there is a new trend emerging, but in reality nothing happens. Now let’s take a look at the exponential moving average. Exponential Moving Average is a type of weighted moving average. Its weights decrease exponentially beginning from the last value (the most recent time interval) and are never equal to zero. This means the exponential moving average sets certain weights to each value in the calculations, and the newer a period is, the higher the weight. The green line (30 EMA) is closer to the price than the red one (30 SMA). This means the exponential moving average reflects the price dynamics more accurately than the simple average. This happens because the exponential moving average (ЕМА) makes greater emphasis on the recent price moves. Of course, in any real situation we are interested in what is happening to the price now rather than what took place a week or a month ago. The MACD indicator gives us 2 values at once: the trend’s power and direction. MACD can also be used to find turning points. 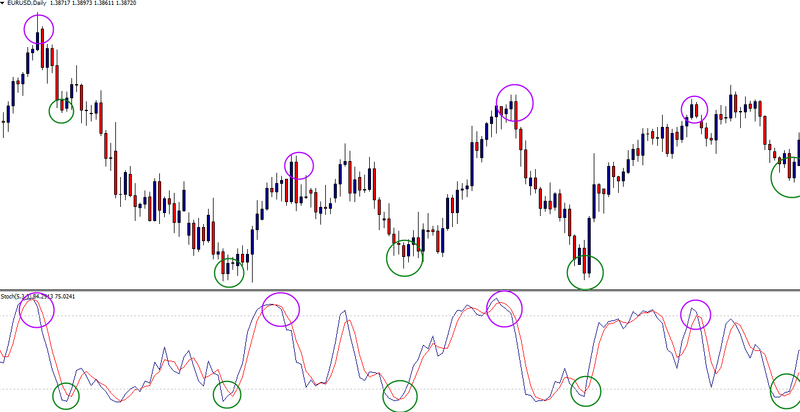 MACD is a dynamic indicator that follows the tendencies of price moves. As a rule MACD is plotted as a histogram, while its smoothed moving average is shown as a signal line. MACD Histogram = Quick MACD Line — Slow MACD Line; the indicator’s zero line shows the level on which exponential average prices of two periods are equal. The indicator values above zero show the increase of a price in the short term in comparison with the long term, that is, a growing trend, and vice versa. The signals are as follows: if MACD crosses the zero line top-down, we have a selling signal; if the zero line is crossed down-top, it indicates an upward trend. MACD is also very useful as an indicator of overbought/oversold market. If the signal line crosses the indicator histogram top-down, this means the asset is overpriced, so the price may come back to a more realistic level. The contrary situation with down-top crossing can be interpreted as a bullish trade signal. Divergence is quite a rare signal. If there is a divergence between the histogram and the price, this shows that the trend gets weaker and the new one is formed. There can be a bullish or a bearish divergence. When a bullish divergence happens, we see that while a new maximum on the graph is higher than the previous one, the new maximum of the indicator is lower than its previous maximum. And if there is a divergence between the new minimums of the price and the MACD histogram, it prompts us about a bearish reversal. This indicator has several drawbacks: it legs behind when the new trends are formed, and gives false signals in the near term. Parabolic SAR is an indicator suggested by Welles Wilder as a method for defining potential turning points of the market price. Parabolic SAR is an indicator that follows market trends, which means it legs behind in the near term. So, how does one trade with Parabolic SAR? This indicator shows potential turning points – the points where trend reversal is likely to happen – as dots on the graph. If a down trend is about to begin, you will see dots above the trend line; the dots under the trend line signal a forthcoming up trend. We can trade with this indicator using it as a source of purchase signals: if there are 3 to 5 dots above the trend line, this is a signal for buying a put-option; in the same way, if there are 3 to 5 dots below the trend line, this is a signal for buying a call-option. Parabolic SAR signals are very simple to interpret, because this indicator provides signals only if the price rises or falls. We can conclude that Parabolic SAR works best for the markets with good trends. It will not show good results, for instance, on currency markets, or any other markets with volatility and sideways trends. Let’s begin with a definition of an oscillator. The name comes from the Latin verb «oscillo», which can be translated as «I swing». In the market application it means a system of analysis, the characteristics of which are oscillating, that is, repeated periodically. Stochastic oscillator shows if an equity is overbought or oversold; it is plotted on the graph as 2 lines: a quick one and a slow one. The indicator’s values on the graph can vary from 0 to 100, where values above 80 mean that the market is oversold, and therefore signal a down trend. On the contrary, the values below 20 mean that the market is overbought, so an up trend is about to take place. It is really quite simple. This one is for fans of quick (but not very easy) money – for traders who are trying to outrun the price curve on short intervals and trade binary options from 60 seconds to 5 minutes. Since this resembles a practice popular on the Forex market, some people call it binary options scalping. Raff Regression Channel is an effective indicator to deal with prices in short-term intervals. This method was developed by Gilbert Raff. 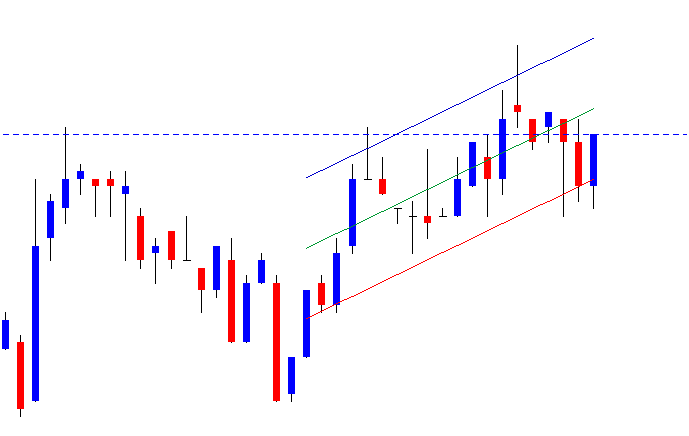 The use of this indicator resembles ordinary support and resistance trading. The indicator’s upper line is used instead of the resistance line, and the lower one instead of the support. The positions can be opened for 1-2 minutes if the price bounces from any of them to the central equilibrium line. The prices can cross the limits of the channel, but if a price stays outside for a longer time, this is a hint of a possible trend reversal in the nearest future. Short-interval trading does not rely on forecasting – it is solely technical. Therefore this indicator is highly advisable as a strategy for trading from 60 seconds to 5 minutes. We wish you good trades! PracticalBinary.com is a binary options broker review site, dedicated to providing all our visitors with the most quality current ratings and news in the world of binary options. While we always strive for excellence, we take no, and cannot be held, responsible for the actions or content of the sites we link to. Our site's services are solely for information gathering purposes. As in all internet commerce, site's terms and prices change frequently, thus it is the responsibility of any user to check and verify bonuses and/or costs before making any investments or purchases. All content and information found on PracticalBinary.com is the sole possession of PracticalBinary.com and any unauthorized use of the content on this site, plagiarizing, will be persecuted.